I started using VMware back in 2004/5 when I was working for HP. My first vMotion experience was incredible. Started designing and managing VMware environments since 2008. I attended a VMUG session, which was spearheaded by Andrew Mitchell (#30) back in 2009 about VCDX. He spoke about this certification I never knew about and how there were only (at that point) 50 people in the world that had it. I wanted to be one of those who have this certification. One could call it an aspiration to be one. Like when you look at a pilot when young and think “I want to be one”. Andrew Mitchell, Josh Odgers, Scott Lowe, Duncan Epping, Frank Denneman, Michael Webster and all the other VCDXs are the inspiration to “prove to myself” that I have what it takes to achieve this. 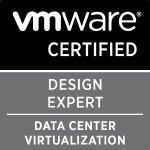 I did my VCP 4 in early 2009. Did my VCAPs in 2010 and again in 2012. I started working very seriously on VCDX only in 2013. I would say it was done over a year. VCDX is only the start of the journey to excellence. You never stop learning. Plan your certifications. It’s a big investment in time and effort. Don’t rush. Form a study group. Ask current VCDXs for help with mock panels. Without help from Josh Odgers and others I wouldn’t have been able to do it. Do lots of mock defence panels including design and TS scenarios. Be open to feedback. Learn from your mistakes. Be prepared to spend a lot of nights studying. I mean a lot of nights J.
Injure my leg and have a head full of painkillers during my first defence J. On a serious note, I would do nothing differently. I should probably have done this a lot sooner. Life hasn’t changed much, except I get to sleep a lot earlier now. And have a few new followers on twitter. My company responded well. Haven’t changed what I am doing yet. It was worth doing VCDX as it’s now given me a solid platform to learn more. VCDX is only the beginning of the journey not the destination. Categories: Certifications, VCAP, VCDX, VMware | Tags: design, VCAP, VCDX, VMware | Permalink.